This California Highway Patrol Cruiser was built for our Open Division race for parents and leaders. It actually won first for speed! 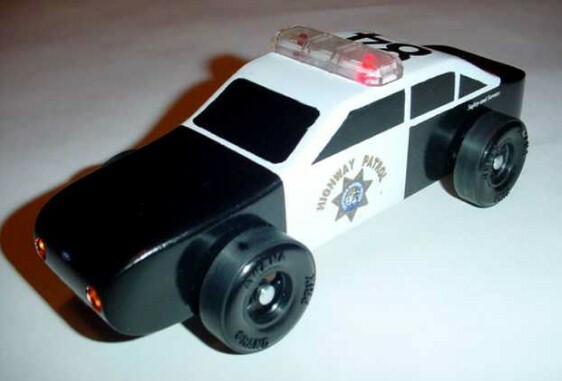 The cruiser has working headlights, flashing lights, and a siren. All of the electronics came out of a model from a hobby store. To have enough space to get all of it into the car, the block was cut into horizontal sections. All of the excess inner wood was then removed. The sections were then glued back together, the body outline was cut, and the car was finished. There is a small access door on the bottom of the car to be able to install the electronics and the door has speaker holes. The electronics had to be cut apart (a smaller speaker was used) and then installed into the car along with a battery holder. It was a tight squeeze, but it fit! Surprisingly, with all of the electronics, speaker, and battery pack, an ounce of weight was still needed to reach 5 ounces. The siren and lights turn on and off, with a slide switch installed where you would expect the rear license place to be. The siren unfortunately would only stay on a few seconds once the switch was turned on, but humorously it would kick back on when the car hit the stopping blocks at the finish line. 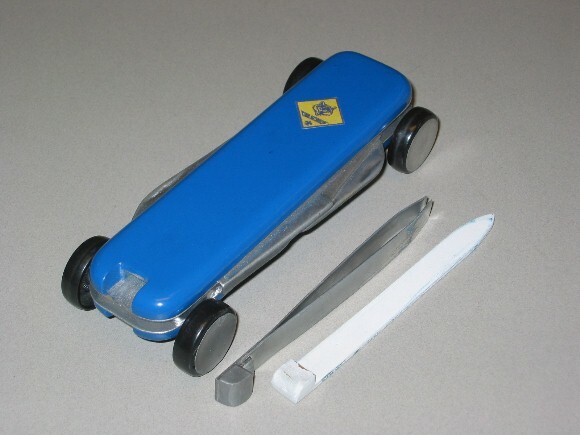 My son Tyler and I made this knife car in 2000 while he was a Wolf cub in Pack 430 in Roswell, Georgia. 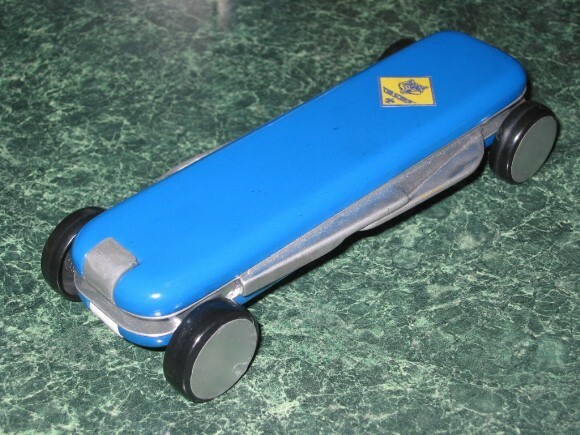 We nicknamed the car “Akela’s Blade”. 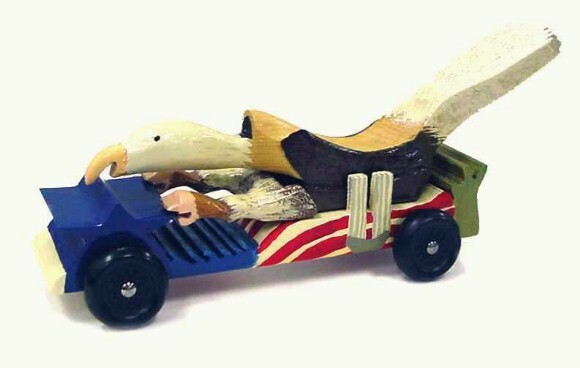 The car body was made from six pieces of wood sandwiched together. The blade layers, toothpick and tweezers were shaped from thin craft plywood from a hobby store. The blades don’t come out, but the toothpick and tweezers do. Yes, Tyler had a lot of help building the car. We didn’t think a second grader should be using a router, which we used to round the edges and make the channels for the wooden knife and toothpick. But Tyler did do most of the sanding and painting. This car is also fast, which precluded it from winning any design awards. It finished first amongst the Wolves in our Pack and was therefore not eligible for a design award. And we opted to compete for speed and not design at the district level, where we placed fourth, just missing a trophy. After putting in better than 20 hours building this car, we have since opted for simpler designs! I built this car as a tribute to post-9/11 New York City, and all the good that the city displayed as the citizens pulled together and worked as one during the aftermath. The very back of the car depicts the ideals that Lady Liberty represents: Democracy, Freedom and Opportunity (to pursue the American Dream). The two towers in the middle of the car represent the Twin Towers that are now gone but will never be forgotten. The waves washing up on the star represent the ocean waves washing up on the shore of America bringing the huddled masses to the land of freedom and hope. The star on the front of the car, and the red, white and blue paint theme represent the Spirit of America, a spirit that can never be broken. The ram inducted turbo eagle represents all Americans embracing everything that America stands for and in keeping with their duty to God, to Country, and to help other people.